Convert MBOX to PST: If you want to import SeaMonkey, Mac Mail, Eudora, Entourage, The Bat, Barkeley or other MBOX supported email client mailbox to Outlook, then export MBOX files as PST is the best choice for you. 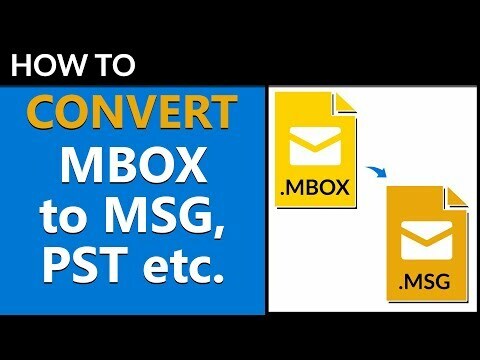 Import MBOX to MSG: Export MBOX files to MSG format to migrate MBOX emails to MS Outlook in single message format i.e. MSG file. Export MBOX to EML: Import MBOX file to Windows Live Mail, eM Client, Outlook Express or other EML file supported applications. Migrate MBOX to EMLX: Open MBOX files in Apple Mail email client. Convert MBOX to PDF: Save MBOX emails as Adobe PDF files to secure formatting in local storage. Export MBOX to HTML: Obtain MBOX emails as separate HTML files to open or read in simply Web browsers. Import MBOX to MHT: Open MBOX file items into Internet Explorer, Firefox, Chrome etc. Convert MBOX to XPS: Save MBOX file items to open it in Microsoft XPS viewer for free. Transfer MBOX files to RTF format: Open MBOX file emails in WordPad or other simple word editors. Convert MBOX to DOC: Open MBOX files into Microsoft Word 97-2003 as well Word 2016, 2013, 2010, 2007 also. Import MBOX to Office 365: Direct method to upload Gmail to Office 365 account as well all type types of MBOX files migrate to Office 365. Outlook Web Access Account login credentials required including Internet connection to export MBOX data to Outlook 2016. Import MBOX to Lotus Notes: Convert MBOX to NSF format to export MBOX mailbox into IBM Lotus Notes. Migrate MBOX to Zimbra: Convert MBOX file to TGZ format to Import MBOX file into Zimbra Desktop or Web Client. Import MBOX to Thunderbird: Direct option to import MBOX files to Mozilla Thunderbird email client without requiring any additional Import/Export Add-on. 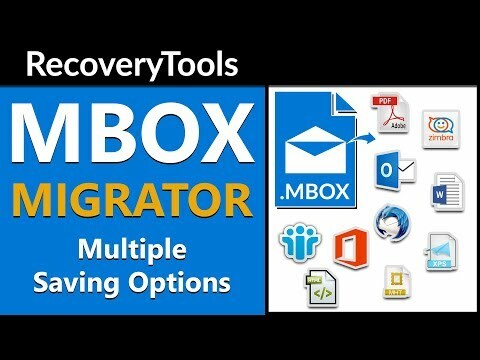 RecoveryTools MBOX Migrator was added by recoverytoolsrt in Oct 2017 and the latest update was made in Oct 2017. The list of alternatives was updated Dec 2018 There is a history of all activites on RecoveryTools MBOX Migrator in our Activity Log. It's possible to update the information on RecoveryTools MBOX Migrator or report it as discontinued, duplicated or spam.